Referred to as Zero Kelvin. The mixture of gases and particles that make up our atmosphere. A past situation, which resembles the current situation, is called an analogue, which can then be used as a guide for what is to come. For example, by finding similar SOI patterns to the current year, we can then determine tropical cyclone events from that time to use as a guide as to what will happen this year. The departure of an element from its long-period average value for the location concerned. The current international standard is to use the 30 year average from 1961 to 1990 as the long-term average. Atmospheric circulations that rotate anti-clockwise in the southern hemisphere and clockwise in the northern hemisphere. Anticyclones are areas of higher pressure and are generally associated with lighter winds and fine and settled conditions. The mixture of gases surrounding a planet. One of the four seasons of the year. The transition months March, April and May in the southern hemisphere, and September, October and November in the northern hemisphere. The measurement of the depth of the ocean floor from the water surface and is the oceanic equivalent of topography. A closed counterclockwise circulation on the 925 hPa wind field within the area of 2.55°S-7.55°N, 107.55°-117.55°E in the equatorial South China Sea. During surge events, deep convection occurs in association with the blocking of the low-level winds by the terrain in the northern part of Borneo island, which causes a shift of the convection pattern downstream of the converge maximum at 925 hPa. The shift is smaller at 850 hPa because there is less blocking of winds at higher elevations. Chance of rain describes the likelihood of receiving a measurable amount of rain (>0.2mm) during the day at that location. Slight chance is used when the likelihood is between 15% and 34%. Medium chance is used when the likelihood is between 35% and 64%. High chance is used when the likelihood is between 65% and 84%. Very high chance is used when the likelihood is 85% or higher. Mass of water droplets or ice crystals caused by water vapour in the atmosphere condensing or freezing. As air ascends through the atmosphere, it cools as it rises. The water vapour in the rising air condenses into droplets and forms clouds. As the droplets rises they form tiny ice crystals. When the droplets/ice crystals are large enough they may fall as rain, hail or snow. Sunny: Little chance of the sun being obscured by cloud. High level cirrus clouds are often thin and wispy, allowing a considerable amount of sunlight to penetrate them, sufficient to produce shadows. In this case the day could be termed 'sunny' even though more than half the sky may be covered in cirrus cloud. Cloudy: Predominantly more cloud than clear sky for example, during the day the sun would be obscured by cloud for substantial periods of time. Change from a gas to a liquid. The process generally associated with warm rising air and the formation of cloud. Local breezes, wind and thunderstorms are a result of convection in the atmosphere. Heavy, puffy, heaped, dark cloud of great vertical depth, often bringing rain. Some have a distinctive anvil shaped head. The rapid development of a topical disturbance or tropical low or intensification of a pre-existing one. Atmospheric circulations that rotate clockwise in the southern hemisphere, and anti-clockwise in the northern hemisphere. Cyclones are areas of lower pressure and generally associated with stronger winds, unsettled conditions, cloudiness and rainfall. Sometimes referred to as Tropical Revolving Storms. The Dry Adiabatic Lapse Rate (DALR) is the rate at which the temperature of unsaturated air changes as a parcel ascends or descends through the atmosphere. The DALR is approximately 9.8 degree Celsius per 1 km. Droplets of water deposited when air cools and the water vapour in it condenses. This is a measure of the moisture content of the air and is the temperature to which air must be cooled in order for dew to form. The dew-point is generally derived theoretically from dry and wet-bulb temperatures, with a correction for the site's elevation. If the dry-bulb temperature is the same as the dew-point, the air is said to be saturated and the relative humidity is 100%. The changes of value of meteorological elements i.e. temperature and pressure within the course of a (solar) day. More especially, it denotes the systematic changes that occur during the average day. Violent and damaging downdraught striking the surface of the Earth violently. Associated with a severe thunderstorm. Fairly uniform precipitation (rain) composed exclusively of very small water droplets (less than 0.5 mm in diameter) very close to one another. Prolonged absence or marked deficiency of precipitation (rain). As used by forecasters, free from rain. Normally used when preceding weather has also been relatively dry, and dry weather is expected to continue for a day or so. A storm which carries large amounts of dust into the atmosphere. Ensemble of particles of dust or sand energetically lifted to great heights by a strong and turbulent wind. East Coast Lows are intense low-pressure systems which occur on average several times each year off the eastern coast of Australia, in particular southern Queensland, NSW and eastern Victoria. Stands for El Niño-Southern Oscillation. 'El Niño' used here refers to the warming of the oceans in the equatorial eastern and central Pacific; Southern Oscillation is the changes in atmospheric pressure (and climate systems) associated with this warming (hence 'Southern Oscillation Index' to measure these changes). 'ENSO' is used colloquially to describe the whole suite of changes associated with an 'El Niño' event - to rainfall, oceans, atmospheric pressure etc. Change from a liquid to a gas. As used by forecasters, no rain or other precipitation (hail, snow etc.). The use of fine is generally avoided in excessively cloudy, windy, foggy or dusty conditions. In particular note that fine means the absence of rain or other precipitation such as hail or snow - not 'good' or 'pleasant' weather. Estimation of height, discharge, time of occurrence, and duration of a flood, especially of peak discharge, at a specified point on a stream, resulting from precipitation and/or snowmelt. Advance notice that a flood may occur in the near future at a certain location or in a certain river basin. Change from a liquid to a solid. In other regions along the front, warm air of lower density moves polewards, sliding over its sloping surface. This portion is called a warm front. Warm tropical air replaces cold polar air. When the cold front moves faster than the warm front, and as it overtakes the warm front, the warm sector is closed and a combine front forms. This process is called occlusion. A Gale Warning is a statement which warns of winds averaging from 34 knots and up to 47 knots in coastal waters and high seas areas. Geopotential height approximates the actual (gravity-weighted) height of a pressure level above mean sea-level. When the wind is steady, horizontal, and flowing parallel to straight isobars it is called the geostrophic wind. Where the Pressure Gradient force is exactly balanced by the Coriolis force. Clock time at the Royal Observatory in Greenwich, London. It is the standard time against which all the other time zones in the world are referenced. A steady, horizontal wind flowing along curved isobars is called gradient wind. Where there is imbalance between the pressure gradient and Coriolis forces. When the pressure gradient force is greater than the Coriolis force, the flow takes on a curved path around low pressure. When Coriolis is the larger force, the curved flow is around high pressure. A natural warming process of the earth. When the sun's energy reaches the earth some of it is reflected back to space and the rest is absorbed. The absorbed energy warms the earth's surface which then emits heat energy back toward space as longwave radiation. This outgoing longwave radiation is partially trapped by greenhouse gases such as carbon dioxide, methane and water vapour which then radiate the energy in all directions, warming the earth's surface and atmosphere. Without these greenhouse gases the earth's average surface temperature would be about 33 degrees Celsius cooler. A gust is any sudden increase of wind of short duration, usually a few seconds. Precipitation (falling) of particles of ice (hailstones). Usually spheroid, conical or irregular in form and with a diameter varying generally between 5 and 50 millimetres. Hail falls from clouds either separately or collected into irregular lumps. State of atmospheric obscurity due to the suspension in the air of extremely small dry particles invisible to the naked eye. Haze resembles a uniform veil over the landscape that subdues its colours. When viewed against a dark background (e.g. a mountain) it has a bluish tinge but it has a dirty yellow or orange tinge against a bright background (e.g. sun, clouds). Haze is distinguished from mist when the humidity is less than 90% at the time. Relatively high water vapour content in the air, often associated with warmer temperatures. Relative Humidity (RH) and the Dewpoint Temperature can be used as indicators of humidity. The coastal waters zone within 12 nautical miles of the coast. An area of unstable atmospheric conditions dividing the northern hemisphere northeast trade winds and the southern hemisphere southeast trade winds. The ITCZ migrates north / south, expands and contracts following the seasonal movements of the sun and the relative strength of the prevailing trade winds. Lines on weather maps joining places which have the same air pressure. A flat, tubular current of air located in the tropopause, the area in the Earth's atmosphere located between the troposphere and the stratosphere. These powerful winds are generated by strong pressure gradients which reflect the great temperature differences at high altitudes. Zero Kelvin is referred to as "Absolute Zero". Unit of speed equal to one nautical mile per hour. A local offshore wind. At night, when the land cools more quickly than the sea, the land breeze circulation is set up. Cooler air from the land flows offshore to replace the warm air rising over the sea. The air in contact with the sea warms and expands and the resulting changes in the pressure and temperature differences and distributions cause the land breeze circulation. The flash of light accompanying a sudden electrical discharge which takes place from or inside a cloud, or less often from high structures or the ground or from mountains. A large electrical spark. Caused when the negative charge in the lower part of the cloud and the positive charge in the upper part of the cloud become so great that they can overcome the natural resistance of the air and discharge between negative and positive takes place. Atmospheric circulations that rotate clockwise in the southern hemisphere, and anti-clockwise in the northern hemisphere. Cyclones are areas of lower pressure and generally associated with stronger winds, unsettled conditions, cloudiness and rainfall. The globe is divided into Standard time zones and Local Standard Time is the time specified for each zone. This is usually done in terms of hours ahead or behind UTC. Eastward movement of large-scale circulation cells oriented in the equatorial (zonal) plane in the troposphere. The MJO is associated with enhanced low-level convergence and ascent in the synoptic scale, while winds in the upper troposphere diverge from the updraft. This circulation is accompanied by enhanced deep convection. Its cycle is split up into eight phases, each of which corresponds to 1/8 of the full cycle. An individual MJO event can last anywhere from 30 and 60 days. Weather outlooks of wind, temperature, precipitation/rainfall, visibility, convective inhibition, CAPE, Total-total Index, and PABL height for 36 or 72-hours. Presented as a graph, these outlooks are extracted directly from the WRF NMM and ARW mesoscale models run by OWS in-house. The areas between about 30 degrees and 55 degrees latitude in the northern and southern hemispheres. For Australia, this is the area south of a line from halfway between Geraldton and Perth (in Western Australia) to Bourke (in New South Wales). This part of Australia generally experiences a temperate climate. Optical refraction in the atmosphere consisting of images displaced from their true positions. A seasonal shift in the prevailing wind direction that brings with it different kind of weather. The Asian monsoon covering India to Southeast Asia is associated with prevailing wind blowing from the southwest between May and September during the northern hemisphere summer-autumn season. Wind during this monsoon season is warm and moist, bringing rain (SW Monsoon). The wind shifts and blows from the northeast between October and April during the winter-spring season. Wind during this monsoon season is cold and dry (NE Monsoon). The northern Australian monsoon season generally lasts from December to March. It is associated with the inflow of moist west to northwesterly winds into the monsoon trough, producing convective cloud and heavy rainfall over northern Australia. These moisture-laden winds originate from the Indian Ocean and southern Asian waters. The north Australian wet season encompasses the monsoon months but can extend several months on either side. MSL stands for Mean Sea Level. It is necessary to convert the pressure readings to equivalent mean sea level pressures, otherwise the important horizontal changes in pressure would be overwhelmed by vertical variations simply due to differences in height between observing stations. In this way, a Mean Sea Level Pressure (MSLP) map will then show pressures affected by changing weather conditions, not because of changing altitude. The prevailing wind blowing from the northeast over Asia covering India to Southeast Asia during the months of December to March (northern hemisphere summer-autumn season). Wind during this monsoon season is cold and dry (dry monsoon). Events that often occur during the peak of boreal winter monsoons (December-January-February). When the strong flow associated with NCS propagates southward and crosses the equator, it may affect the intensity of convection in the South China Sea and the Maritime Continent. The time scale for the whole system is a few days to a week. The northern extent of the Inter Tropical Convergence Zone (ITCZ). Plays an important part in tropical cyclone development over the NW Pacific Ocean. The coastal waters zone between 12 and 60 nautical miles from the coast. One of the several gases that make up the Earth's atmosphere. It is the triatomic form of oxygen and makes up approximately one part in three million of all of the gases in the atmosphere. If all the ozone contained in the atmosphere from the ground level up to a height of 60 km could be assembled at the earth's surface, it would comprise a layer of gas only about 3 millimeters thick, and weigh some 3000 million tonnes. Ozone is toxic at high concentrations because it reacts strongly with other molecules. The term for denoting thresholds or boundary values in frequency distributions. Thus the 5th percentile is that value which marks off the lowest 5 per cent of the observations from the rest, the 50th percentile is the same as the median, and the 95th percentile exceeds all but 5 per cent of the values. When percentiles are estimated by ranking the items of a finite sample, the percentile generally falls between two of the observed values, and the midway value is often taken. Any or all of the forms of water particles, whether liquid (e.g. rain, drizzle) or solid (e.g. hail, snow), that fall from a cloud or group of clouds and reach the ground. Sporadic: scattered or dispersed in respect of locality or local distribution. Characterised by occasional or isolated occurrence. An attempt to convey the uncertainty in a forecast by expressing its likelihood of occurrence as a probability or percentage. High probabilities do not guarantee an outcome - they merely indicate that that outcome is highly likely. Probabilities are usually based on the frequency of occurrence in the historical record. For instance, if the chance of receiving above-median rainfall in a particular climate scenario is 60%, then 60% of past years when that scenario occurred had above median rainfall, and 40% had below-median rainfall. QFE is calculated by adjusting the station level pressure for the difference between the barometer level and the aerodrome reference level, assuming International Standard Atmosphere (ISA) conditions. An Altimeter set to QFE will read zero when the aircraft is on the runway. QNH is the pressure measured at station then reduced down to mean sea level pressure. Precipitation of liquid water drops greater than 0.5 mm in diameter. In contrast to showers, it is steadier and normally falls from stratiform (layer) cloud. The total liquid product of precipitation or condensation from the atmosphere, as received and measured in a rain gauge. 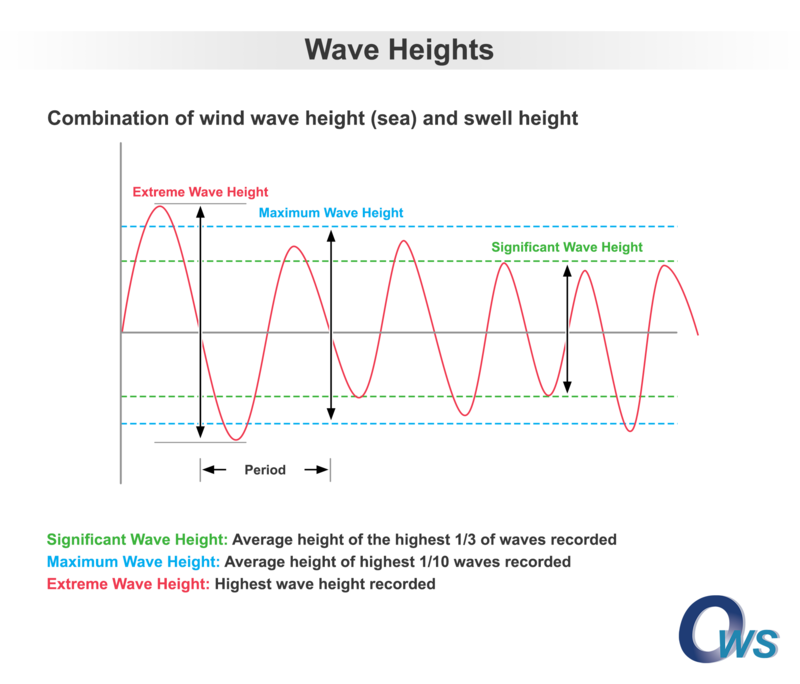 A Rogue wave is generally considered when the maximum wave height(Hmax) vs Significant wave height(Hs) ratio exceed 2. OWS refer to significant rogue waves risk and include that the Hs should to be greater than 3m. It is assumed that Rogue waves occur during exceptional wave steepness and this is exacerbated by opposing currents. The wave steepness is calculated from the output of WAVEWATCH III(c) model at hourly intervals and the forward speed (period) of the waves modified by the surface currents derived from the SHOC model. OWS assume the risk of a rogue wave as usually very low. A wave steepness value (ak) ~= 0.45 indicate wave breaking (Babanin 2011a, 2007) and OWS assume a value of 0.3 - 0.35 indicate a low possibility of a Rogue Wave. Refraction due to current (Wang 1994) are subjectively asset to identify region where the risk should be increased to moderate. OWS use value of very low <2%, low < 5%, moderate about 20%. No high value is provided as the risk of occurrence and ability to forecast rogue waves are very low. Babanin, A.V., Chalikov, D., Young, I.R. and Savelyev, I. (2007). Predicting the breaking onset of surface water waves. Geophys. Res. Lett., 34: 6p. Wang, D. W., A. K. Liu, C. Y. Peng, and E. A. Meindl (1994), Wave-current interaction near the Gulf Stream during the Surface Wave Dynamics Experiment, J. Geophys. Res., 99(C3), 5065–5079. Copyright 1994 American Geophysical Union. Reproduced/modified by permission of American Geophysical Union. The SALR is often taken as 1.5 degree Celsius per 1000ft, although the actual figure varies according to the amount of water vapour present. A local onshore wind. Cooler air from over the sea flows onto the shore to replace the warm air rising over the land. On sunny days the land heats up more quickly than the sea. The air in contact with the land warms and expands and the resulting changes in the pressure and temperature differences and distributions cause the sea breeze circulation. At night, when the land cools more quickly, and to a greater extent, than the sea, the reverse land breeze circulation is set up. Autumn - the three transition months September, October, November. Winter - the three coldest months December, January and February. Spring - the transition months March, April and May. Summer - the three warmest months June, July and August. Spring - the three transition months September, October, November. Precipitation, often short-lived but may last half an hour and heavy, falling from convective clouds. Usually begin and end suddenly. Plays an important part in Tropical cyclone development over the Indian Ocean, Timor Sea and South Pacific Ocean. A squall is a sudden increase in wind speed at least 15 knots with a top speed of at least 21 knots lasting at least one minute in duration. Squalls are produced when an unstable air is heated producing deep convection. Downbursts from the mature cells lead to the development of a squall line or squall front. After a squall event, the mean wind returns to near its previous value. A squall may include many gusts. A Squall Warning is a statement which warns of a risk of squalls categorised as low, moderate and high. Squall Warnings include the current location of squall line including direction of movement and speed, expected time of arrival at forecast location, and the expected intensity and duration of the squall event. Anomalies in the surface temperature are associated with changes in the heat exchange between atmosphere and ocean, or changes in ocean currents or upwelling, and these changes can drive large changes in rainfall and atmospheric circulation patterns. SSTAs are therefore often strongly related to the development and maintenance of unusual climate patterns, such as ENSO. The three hottest months December, January and February for the southern hemisphere, and June, July and August for the northern hemisphere. A persistent, single, intense updraught and downdraught coexisting in a thunderstorm. The Asian monsoon covering India to Southeast Asia is associated with prevailing wind blowing from the southwest between May and September during the northern hemisphere summer-autumn season. Wind during this monsoon season is warm and moist, bringing rain (wet monsoon). Chart showing lines of equal pressure (isobars), corrected to mean sea level (MSL), over a broad area (eg SE Asia, Australia). Based on the synoptic observations taken simultaneously every 3 hours by weather observers and Automatic Weather Stations around the world. A physical quantity characterising the mean random motion of molecules in a physical body. Sudden electrical discharges manifested by a flash of light (lightning) and a sharp rumbling sound. Thunderstorms are associated with convective clouds (Cumulonimbus) and are more often accompanied by precipitation. They are usually short lived and hit on only a small area. Early in the morning: Expected to occur before 6am. In the morning: Expected to occur between 6am and 10am. Middle of the day: Expected to occur between 11am and 1pm. During early afternoon: Expected to occur after 12 noon and 3pm. In the afternoon: Expected to occur between 3pm and 6pm. During the evening: Expected to occur between 6pm and 8pm. Later in the evening: Expected to occur after 9pm. A whirlwind or mass of violently rotating winds having the appearance of a funnel-shaped cloud and advancing beneath a large storm system. Measure or Index of atmospheric instability used to assess the strength of storms and for severe weather forecasts. A combination of calculations relating to the air temperature and dew point temperature at different levels of the atmosphere. East to southeasterly winds (in the southern hemisphere) which affect tropical and subtropical regions, including the northern areas of Australia. During the monsoon season in northern Australia, the easterly trade winds are replaced by moist northwesterly (monsoonal) winds from the Indian Ocean and southern Asian ocean waters. In the northern hemisphere however, the trade winds are east to northeasterly in direction. It means that in both hemispheres, they tend to blow from the east to the west and towards the equator. Sometimes the trade winds will just be called "easterly" to avoid having to specify the hemisphere. Tropical cyclones are intense low pressure systems which form over warm ocean waters at low latitudes. Tropical cyclones are associated with strong winds, torrential rain and storm surges in coastal areas. Tropical cyclones can cause extensive damage as a result of the strong wind, flooding (caused by either heavy rainfall or ocean storm surges) and landslides in mountainous areas as a result of heavy rainfall and saturated soil. When tropical cyclones attain maximum mean winds above 117 km/h (63 knots) they are called severe tropical cyclones in Australia, typhoons in the northwestern Pacific and hurricanes in the northeast Pacific and Atlantic/Caribbean. The term used in the Bay of Bengal to describe a tropical cyclone with an intensity (as measured by 1 min average surface winds at 10m) greater than 33kt. The term used in the Bay of Bengal to describe a Tropical Cyclone with an intensity (as measured by 1 min average surface winds at 10m) less than 34kt. Equivalent to NW Pacific Tropical Depression. Term used in SW Indian Ocean for Tropical Cyclone with an intensity of 90-114kt. The term used in the SW Indian Ocean for Tropical with an intensity between 34-47kt. Similar to Tropical Storm in the NW Pacific. The term used in the Australia to describe a Tropical Cyclone with an intensity (as measured by 1 min average surface winds at 10m) greater than 64kt. Severe Tropical Cyclone have categories 3, 4, and 5. An area of low pressure over tropical waters, with a well established surface wind circulation and a graded wind field increasing in strength towards the centre, and winds near the centre between 48-63kt. The convective clouds have distinctive ‘spiral bands’. Terms are used in the NW Pacific and SW Indian Ocean. The most intense of typhoons with central surface wind speeds in excess of 130kts, and central atmospheric pressures lower than 904mb in the NW Pacific. The term used in the Bay of Bengal to describe a tropical cyclone with an intensity (as measured by 1 min average surface winds at 10m) in excess of 120kt. Term used in SW Indian Ocean for Tropical Cyclone with central surface winds speed of 64-89kt. Term used in the Australia to describe a Tropical Cyclone with an intensity 34-63kt. Tropical Cyclone have categories 1 and 2. An area of low pressure over tropical waters, with a well established surface wind circulation and convective activity closely associated with the centre of the system. The wind field has graded winds increasing in strength towards the centre of the system, with wind speeds near the centre generally less than 33kts. The central atmospheric pressure is between 1002-1006mb. A disorganised cluster of convective (rain bearing) clouds, close to or surrounding a weak surface circulation with a central pressure lower than the surrounding region. Also known in Australian waters as a tropical low. An area of low pressure in tropical regions that may or may not have associated convective activity or an associated surface circulation. A disorganised cluster of convective clouds, close to or surrounding a weak surface circulation with a central pressure lower than the surrounding region. In Australia, Tropical Low is equivalent in intensity to the Tropical Depression category in the NW Pacific. An area of low pressure over tropical waters, with a well established surface wind circulation and a graded wind field increasing in strength towards the centre, and winds near the centre between 34-47kts. The convective clouds begin forming distinctive ‘spiral bands’. Term used in the northwestern Pacific for a tropical cyclone with maximum winds above 117 km/h (63 knots). A very intense and well developed tropical cyclone with a distinctive ‘eye’ usually visible at the centre of the system. The strongest surface wind speeds are in the ‘eye wall’ immediately surrounding the ‘eye’. Typhoon with surface winds over 130 knots is called Super Typhoon. Term used in the SW Indian Ocean for Tropical Cyclone with central surface winds speed of 115kt and more. The term used in the Bay of Bengal to describe a tropical cyclone with an intensity (as measured by 1 min average surface winds at 10m) greater than 63 knots. Similar to Typhoon category in the NW Pacific. A trough of low pressure is an elongated area where atmospheric pressure is low relative to its immediate surroundings. A trough of low pressure is sometimes indicated on the synoptic chart by a centre line or trough line denoted by a dashed line. The trough line often extends outward from a low pressure centre, or an enclosed area of relatively low pressure. When moving across a trough from one side of a trough line to another, atmospheric pressure decreases as you approach the trough line. The atmospheric pressure increases again after you cross the trough line and move away. A change in wind direction will generally be observed as you cross from one side of the trough to the other. That part of the shadow cast by the Earth or the Moon within which the Sun is completely hidden. Term used as a standard time. This 24-hour time standard is kept using highly precise atomic clocks combined with the Earth’s rotation. Vague term that usually denotes the arithmetic mean, but it can also denote the median, the mode, the geometric mean, and the weighted means. A measurement procedure or estimator is said to be biased if, on the average, it gives an answer that differs from the truth. The bias is the average (expected) difference between the measurement and the truth. The correlation coefficient r is a measure of how nearly a scatterplot falls on a straight line. The correlation coefficient is always between −1 and +1. To compute the correlation coefficient of a list of pairs of measurements, first transform the data individually into standard units. Multiply corresponding elements of the transformed pairs to get a single list of numbers. The correlation coefficient is the mean of that list of products. A deviation is the difference between a datum and some reference value, typically the mean of the data. In computing the standard deviation, one finds the root mean square of the deviations from the mean, the differences between the individual data and the mean of the data. The inter-quartile range of a list of numbers is the upper quartile minus the lower quartile. A mean or average value over a stated period is the arithmetic mean. This is obtained by taking the sum of the individual values and then dividing the sum total by the number of values. The mean of an element for a particular month is obtained by totalling all the values of that element for that month over the period of record and dividing by the number of values. MAE is a quantity used to measure how close forecasts or predictions are to the eventual outcomes. The mean absolute is an average of the absolute errors. The mean absolute error is a common measure of forecast error in time series analysis. The MAE, however, disregards the direction of over- or under- prediction. The MSE is the mean of the square of the errors. The MSE differs according to whether one is describing an estimator or a predictor. MSE(X) = (å (XF−XO)2) / n.
MSE(X) = E( (X−t)2 ). * Where the expected value (E) is the predicted value calculated as the sum of all possible values each multiplied by the probability of its occurrence. "Middle value" of a list. The smallest number such that at least half the numbers in the list are no greater than it. The median for the month is the value of an element which exceeds half the occurrences for that element for that month over the period on record. That is, there is a 50% probability of the element being below the median value. If the values for a month are ranked or arranged in increasing order of magnitude and there are an odd number of values, then the median is the middle value. If the number of observations is even, then the median is calculated by taking the mean of the two middle values. With many meteorological quantities the mean and median values are close and the use of either values is acceptable. Although this may often be the case with annual rainfall, for shorter periods the mean can differ significantly from the median, as the mean can be influenced by an extremely heavy or light value, while the median is not. Hence the median is usually taken as giving a better description of the characteristics of rainfall. The probability of an event is a number between zero and 100%. The probability distribution of a random variable specifies the chance that the variable takes a value in any subset of the real numbers. The probability distribution of a discreet random variable can be characterized by the chance that the random variable takes each of its possible values. Quantiles are points in a distribution that relate to the rank order of values in that distribution. The qth quantile of a list (0 < q ≤ 1) is the smallest number such that the fraction q or more of the elements of the list are less than or equal to it. As such, if the list contains n numbers, the qth quantile, is the smallest number Q such that at least n×q elements of the list are less than or equal to Q. A quartile is a type of quantiles. There are three quartiles. By sorting the sample in increasing order, the middle value of the sorted sample (middle quantile, 50th percentile) is known as the median. First quartile (Q1) is defined as the middle number between the smallest number and the median of the data set. Second quartile (Q2) is the median of the data. Third quartile (Q3) is the middle value between the median and the highest value of the data set. All measurements are subject to error, which can often be broken down into two components: a bias or systematic error, which affects all measurements the same way; and a random error, which is in general different each time a measurement is made. Linear regression fits a line to a scatterplot in such a way as to minimize the sum of the squares of the residuals. The resulting regression line, together with the standard deviations of the two variables or their correlation coefficient can be a reasonable summary of a scatterplot if the scatterplot is roughly football-shaped. The difference between a datum and the value predicted for it by a model. In linear regression of a variable plotted on the vertical axis onto a variable plotted on the horizontal axis, a residual is the "vertical" distance from a datum to the line. Residuals can be positive (if the datum is above the line) or negative (if the datum is below the line). Plot residuals can reveal computational errors in linear regression, as well as conditions under which linear regression is inappropriate, such as nonlinearity. Also known a quadratic mean. The RMS is the square-root of the mean of the squares of a set of numbers. It is a measure of the average "size" of the numbers. To compute the RMS of a list, you square all the entries, average the numbers you get, and take the square-root of that average. The RMSE is a frequently used measure of the differences between values (sample and population values) predicted and the values actually observed. In wind forecast verification, it indicates the differences between the forecast values and actual winds observed. A scatter plot (also called a scatter graph, scatter chart, scattergram, or scatter diagram) is a type of plot or mathematical diagram using Cartesian coordinates to display values for typically two variables for a set of data. Scatter plots show how much one variable is affected by another. The relationship between two variables is called their correlation. For a scatterplot, a line that goes through the point of averages, with slope equal to the ratio of the standard deviations of the two plotted variables. A quantity expressing by how much the members of a group differ from the mean value for the group. The standard deviation is the root mean square of the set of deviations between each element and the mean of the set. An error that affects all the measurements similarly. Systematic errors do not tend to average out. Measure of the amount of local rotation or spin in the atmosphere at a specified level. In weather analysis and forecasting, it usually refers to the vertical component of rotation (i.e. rotation about a vertical axis). The greatest vertical distance between a wave crest and the succeeding or proceeding wave trough in any given observation. This is usually taken as 2.00 times the significant wave height. The average height of the highest one tenth of the waves in any given observation. This is usually taken as 1.67 times the significant wave height. Period in seconds between the swell of the primary swell component. The larger the time difference, the greater the amount of energy associated with the swell. Height and direction of the swell with the highest energy component. This is sometimes referred to as the dominant swell. A water surface wave that is generated and sustained locally by the frictional drag of the wind over the water surface. These waves mainly move in the direction of the prevailing wind. Waves generated by the wind blowing at the time, and in the recent past, in the area of observation. Height and direction of the swell with the second highest energy component. Also known as total wave height. Traditionally defined as the mean height of the highest third of the waves. The combined sea and swell describes the combined height of the sea and the swell that mariners experience on open waters. A water surface wave that has been generated by the wind at a distance from the observer and that travels through the area of the observer and is no longer sustained by the generating wind force. Typically swell is thought of as being generated by wind at least 30-40nm distant from observer. Period in seconds between the swell of the particular swell train (primary, secondary). The larger the time difference, the greater the amount of energy associated with the swell. The time interval between successive wave crests or troughs. However, in a random sea, a commonly used definition is the so-called zero-up crossing period, which is the time interval between two successive up crossings of the mean water level. The vertical distance between a wave crest and the preceding or following wave trough. However, in a random sea a commonly used definition is the so-called zero-up crossing wave height, which is the range of elevations (difference between highest crest and lowest trough) between two successive up crossings of the mean water level. The mean horizontal distance between successive crests (or troughs) of a wave pattern. Wet-bulb temperature is measured using a standard mercury-in-glass thermometer, with the thermometer bulb wrapped in muslin, which is kept wet. The evaporation of water from the thermometer has a cooling effect, so the temperature indicated by the wet bulb thermometer is less than the temperature indicated by a dry-bulb (normal, unmodified) thermometer. The rate of evaporation from the wet-bulb thermometer depends on the humidity of the air - evaporation is slower when the air is already full of water vapour For this reason, the difference in the temperatures indicated by the two thermometers gives a measure of atmospheric humidity. The mean wind speed over a period of time is the mean of many gusts and lulls. Usually only the mean wind is forecast, unless the gusts are expected to be a significant feature. In all weather forecasts issued by OWS, the forecast wind value is a 10 minute mean wind, except for Tropical Cyclone intensity when a 1 minute mean is used. Surface Wind: wind speed and direction measured at 10 metres above the earth's surface. The surface wind drives wave generation locally, and is responsible for large swells generated by strong winds associated with intense storms. The ratio of the distance covered by air parcel to the time to cover that distance. The wind is a continuous succession of gusts and lulls (quiet intervals) associated with equally rapid changes of direction over a range which may exceed 30°. A Wind Warning is a statement which warns of winds ranging from strong, near gale, gale, strong gale, storm, violent storm and hurricane force coastal waters and high seas areas. The three coldest months June, July and August in the southern hemisphere, and December, January and February in the northern hemisphere. The atmospheric pressure which is exerted by water vapour (water in its gaseous state). It is one way of measuring the humidity of the air. At a given temperature, an increase of water vapour in the air corresponds to an increase in the humidity of the air. Water vapour is supplied to the atmosphere by evapouration of water from oceans, lakes, wet land surfaces or from vegetation (transpiration). Water vapour absorbs the Sun's radiation. As a result, the sunlight received at the Earth's surface will be more intense in a drier atmosphere. Component of atmospheric circulation along a line of latitude, towards the east or west. Atmospheric circulation along, or approximately along, parallels of latitude.